Instead, whenever I think of the concept of “One Web” and providing universal access to information on the web, I tend to break it down into something much simpler: give people what they ask for. This is a realization of the One Web principle, whereby content should be accessible on a range of devices irrespective of differences in presentation capabilities and access mechanism. Web sites may paginate their content in various ways corresponding to differences in device characteristics; therefore the navigation structure of the site, and possibly its technical realization, may vary according to the device class that is being served. For those of you fell asleep while reading that blockquote, it’s basically saying it’s alright to optimize the presentation of content as long as the content remains accessible in some way, shape or form. If you click a link or type a URL, you should get content you requested. Hopefully it’s optimized for whatever device/browser you have, but at the minimum it’s about basic access. If you click on a link to cute kitties, you should get cute kitties. Even on your phone. Or your iPad. Or your Nook. Or your Google TV. Or Internet Explorer. Or your Galaxy Note (*shudder*). Or your Blackberry. Or your Chumby. And if you don’t get what you ask for, whether its a mobile homepage, a broken page, partial content, or a video of Rick Astley dancing in a trench coat, you get pissed off. You were expecting something and didn’t get it. You will go elsewhere to find your cute kitties, and many of you will make sure to never come back to the offending site. The many faces of "yeah you're not getting what you want and we're really not sorry." We're too rich for your device. 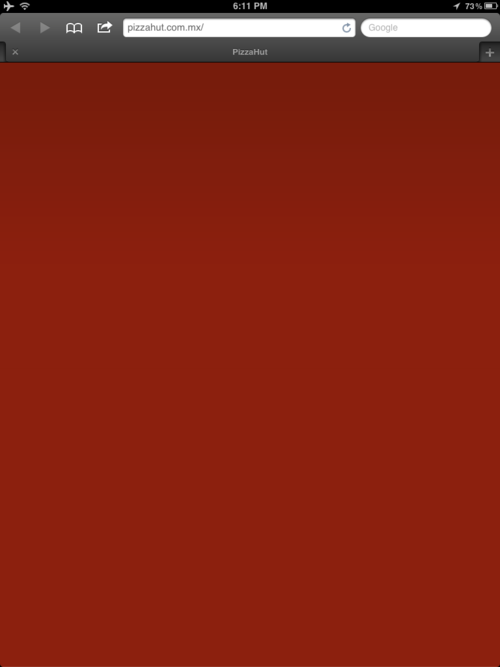 Is it still cool to make fun of Flash homepages? It’s another myth that only certain devices access the web. That’s entirely false, but the attractiveness of iOS and Android inadvertently (or sometimes intentionally) cause people to break the web. Remember, you can still create a great experience for the best of breed devices will still providing support to everyone else. This is a difference between “support” and “optimization”. 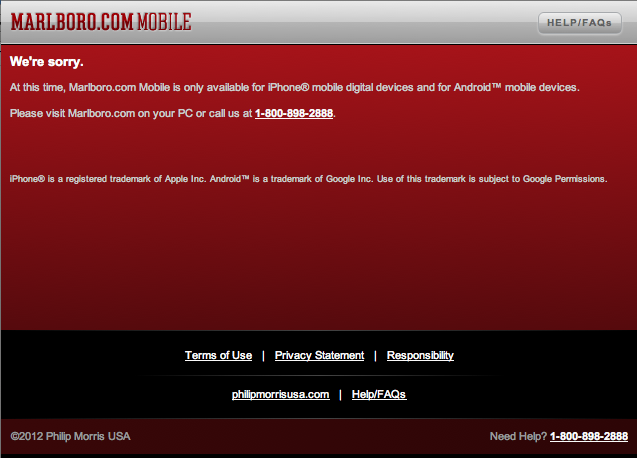 'At this time, Marlboro.com is only available for iPhone mobile digital devices and Android digital devices.' On second thought, I've been meaning to quit anyways. 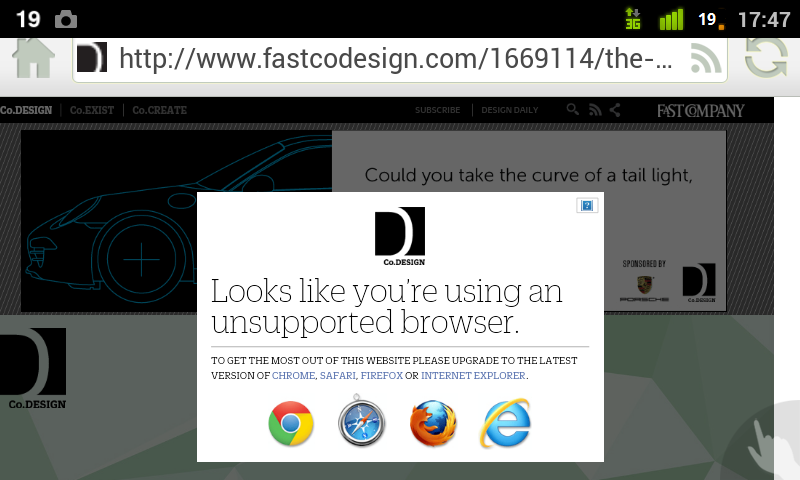 Fast Company Co.Design warns you that the Android browser is unsupported and to upgrade to Internet Explorer, Safari, Chrome or Firefox. The overlay can’t be closed either so you can’t read the site. 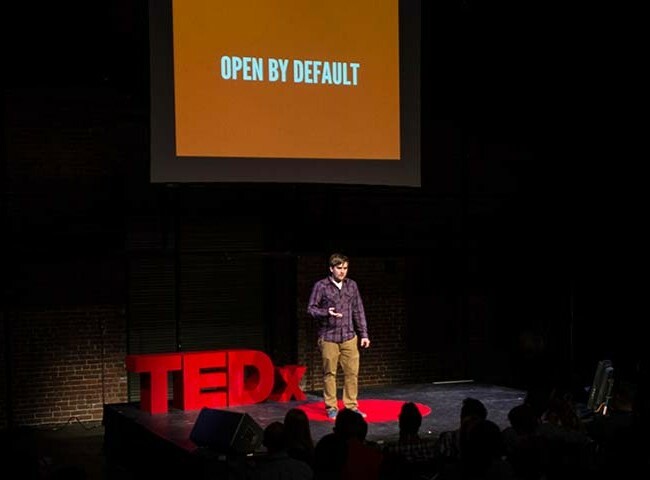 Don’t wall gardens – The beauty of the web is its openness. Don’t arbitrarily lock people out because of browser, device or configuration. And of course, if you’re making the next advanced killer app that requires a certain level of support in order to run, that’s alright too. Just let people down easy if they aren’t invited to the party. Remember, there is no mobile web. UA Sniffing can become unruly – This might surprise you but I’m not opposed to user agent sniffing. It provides opportunities to enhance experiences in a lot of great ways. The problem, as Jeremy puts it, is that using it as a foundation is “committing yourself to an arms race.” It’s up to you to maintain a massive device database, and based on my experience this almost never happens. It just doesn’t scale. Focus on performance – We want to deliver full experiences to mobile users, but we need to be mindful of page weight and performance. 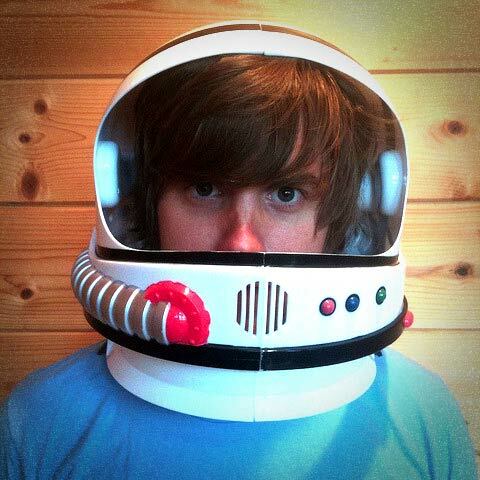 Optimize as much as humanly possible and your users, mobile or otherwise, will thank you for it. Use techniques like progressive disclosure and more to build up from a lightweight core. Be considerate – be mindful of the fact that everybody accesses the web in lots of different ways, and embrace that fact. It’s what makes the web awesome. And keep in mind that today’s landscape will not be tomorrow’s landscape and rise above the short-sightedness of a project deadline to ensure your project’s long-term integrity. 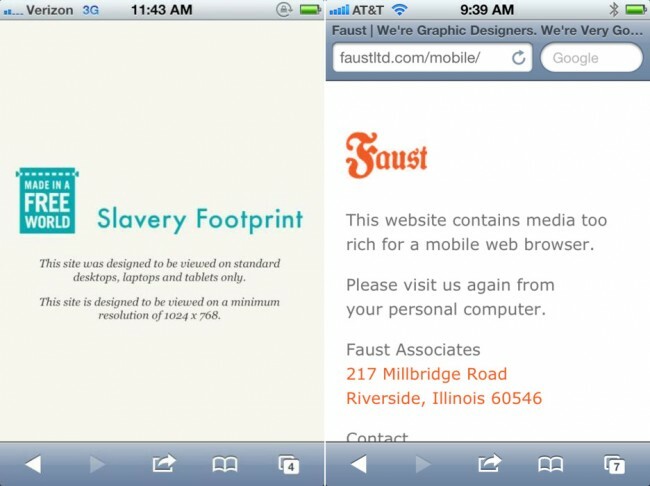 Learn by Example– Go to WTF Mobile Web and take a look at the common pitfalls of mobile web design. And submit your own. While it’s partially funny, it’s also really important to document these challenges so hopefully the same mistakes don’t happen over and over again. Now get out there and give people what they want. Were going through a responsive design process at the moment with a client and I’ve lost track of the number of times I’ve had to explain that we’re not designing for a context or a device, but for the canvas the page is being viewed upon. It’s a long road at the moment but it’s also a relatively new process for everyone so I think it will take a while before people will get in the mind set of content parity across different cavas. Definitely my biggest mobile pet peeve relates to your ‘get what you ask for’ section. Time after time I find mobile wormholes when I’m out and about and want some info. Usually I google, find a link that looks promising, and, once I go there, I get re-routed to some mobile homepage rather than the internal page link I wanted. 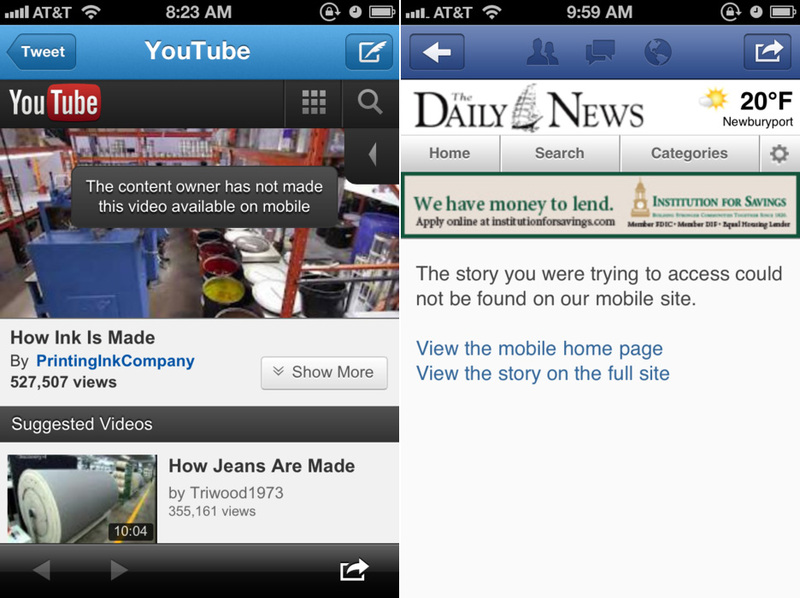 Then I have to try to find the content, and, a lot of times, someone decided someone on mobile doesn’t need that info. Drives me nuts. Like a tiny steering wheel. Couldn’t agree more. In addition, the sad reality is that designers are also forgetting IE6 still exists and is still extremely popular. So, it deserves the same lecture, despite it’s pitfalls. We are starting to design for mobile devices in my job, but we still have costumers that use IE7 as their corporate browser. I think we must not forget that fact althought we are looking for newer tecnologies. I believe it really is that simple. That’s all any of us want, to see the content we requested. When I get what I came for quickly and painlessly I’m happy, when I’m happy I’ll say wonderful things about you and buy stuff. What the IE6/7 doom-brigade seem to mostly overlook is that these browsers have no problem delivering content; the thing visitors come for. Maybe they can’t do hypno-wonder-widgets. Great, no-one came for those and no-one needs them. Let’s make the web a nicer place by not making them. Great article. One Web, One URL – with context-sensitive adaptations on the full content set. 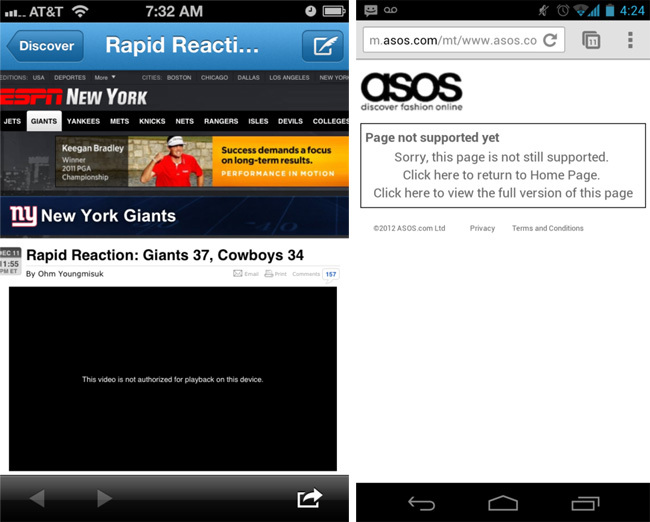 Long live adaptive web! While It have people like Jacob Nielsen and his toughts and studies based on user tests with comments like “I have plenty of other opinions in this story” = conclusion, we have to have a smaller version for mobile, WTF!!! Whenever our UX person says something won’t appear on the mobile or tablet view of their wireframes, I like to ask “why we have it at all?”. If it’s not important enough for smaller devices, is it really worth having on desktop?